Researchers at Vanderbilt University and in Germany have found that sodium — salt — accumulates in the skin and tissue in humans and mice to help control infection. In a report published online Tuesday by the journal Cell Metabolism, they conclude that salt stores may be nature’s way of providing a barrier to microbial invasion and boosting immune defenses. 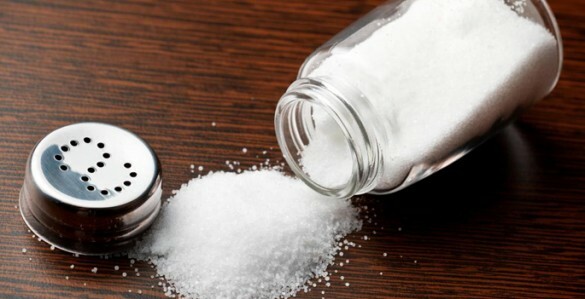 “This is a totally different view on the role of salt in health and disease,” said by Jens Titze, M.D., associate professor of Medicine and of Molecular Physiology and Biophysics at Vanderbilt, the paper’s senior author. The current study began with the observation that salt levels in mice with infected skin were surprisingly high. Jonathan Jantsch, M.D., a microbiologist at Erlangen and Regensburg Universities in Germany and the paper’s first author, suggested that skin might utilize salt accumulation to ward off infections. Indeed, the researchers found that salt increased the activation of infection-fighting macrophages, a type of white blood cell. Utilizing a magnetic resonance imaging (MRI) technique they developed, they also found that salt accumulated at the site of bacterial skin infections in six patients. “The infected legs showed massive salt accumulation, while the uninfected legs were totally normal,” Titze said. The salt accumulation in the infected legs disappeared when the patients were treated with antibiotics. The researchers also tested the effect of an extremely high-salt diet in mice with persistent footpad infections. Salt stores at the site of the infection increased after consumption of the high-salt diet, and the infections cleared up. This does not mean that a high-salt diet is beneficial for health in the 21st century. “This novel biology of salt homeostasis goes beyond the idea that dietary salt is the major component that influences the salt levels in our body,” he added. With the advent of effective antibiotics and other treatments for infection, humans may no longer need huge salt stores to protect them. “Chronic accumulation of salt in the tissue thus may have become rather a problem than an advantage,” Titze said. Titze’s group previously has reported that salt accumulation by skin increases with age and is associated with the development of essential hypertension (high blood pressure), which also becomes more common as people age. “It was a mystery to us why our human subjects accumulated that much salt in their body as they aged, because high blood pressure and cardiovascular disease is clearly a disadvantage,” Titze said. The latest finding suggests that age-related salt accumulation by the skin may be a compensatory response to declining cellular barrier function and microbe entry. It also may reflect chronic, low-level inflammation associated with diseases of “aging,” including heart disease and some cancers. Thus it may be beneficial to counter this age-related increase in salt stores. Toward that end, Titze and his colleagues have received support from a Strategically Focused Prevention Research Network Centers grant from the American Heart Association to find out whether salt stores can be mobilized by dietary lifestyle changes or drugs. This could prevent high blood pressure and cardiovascular disease, he said.